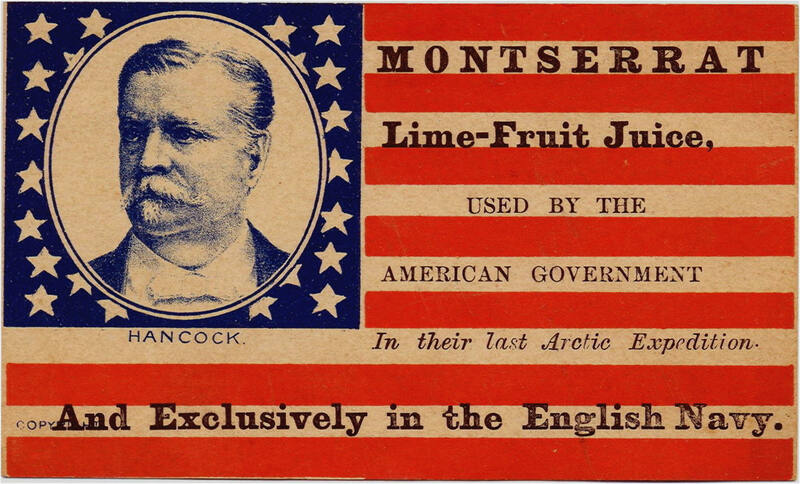 Toward the end of the 19th century, the practice of making trade cards featuring the American flag overprinted with advertising, and often with one or more candidates of an impending political election, became popular among businesses across America. 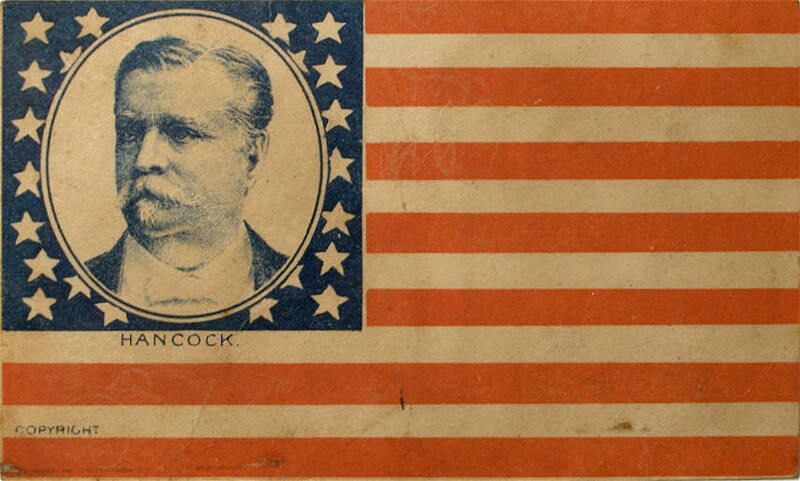 At the height of the practice, circa 1880-1890, trade cards featuring the a presidential portrait or candidate in the canton could be ordered in bulk quantity with custom overprints for a particular business or event. 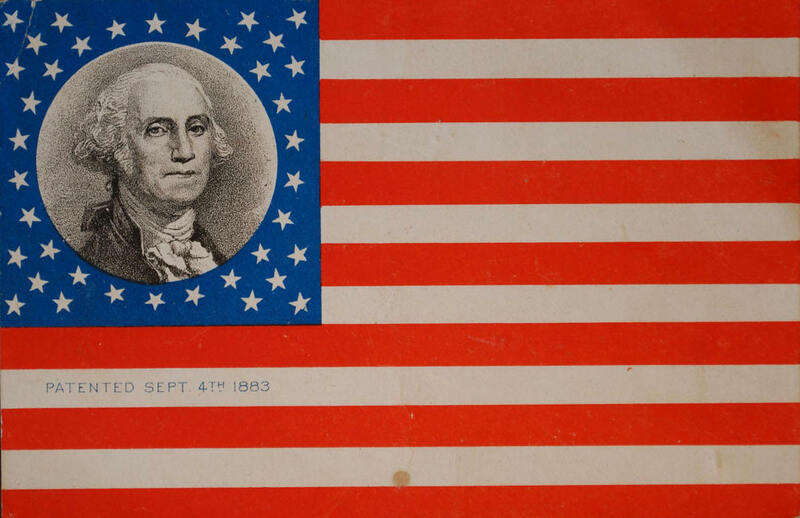 The most prevalent of these were made for the 1880 election between James A. Garfield and Winfield Scott Hancock, printed by Carter, Rice & Co. of Boston. Collectively, they form a charming and unusual focus area for flag collectors. These rare cards are increasingly difficult to find. Many of them may well be unique, the last surviving example of their kind. They interesting because of their folky design. Their brief sales pitches, sometimes printed in a variety of font types and sizes, are curious and fun to read. Ironically, the flag serves as a perfect medium for advertising. After all, who would want to throw away an American flag? Often, the writing on a card allows us to determine the precise location where a card originated, providing a fun geographic exercise as well. I will continue to add more cards to this page as they are found and added to the Rare Flags collection over time. 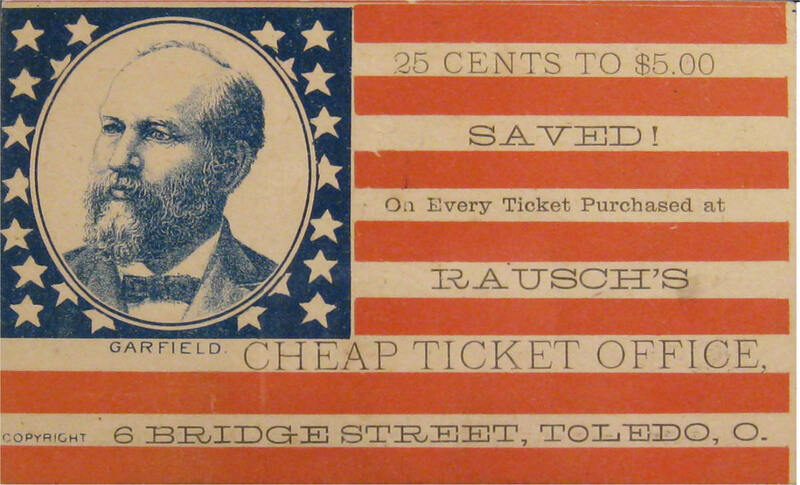 Rausch offered discount tickets to Americans traveling west to the Northwest Territories during the 1880's. Curiously, a search for Bridge Street in Toledo returns no results, though there is a Bridge Street located just outside of Toledo in the suburb neighborhood of Grand Rapids. 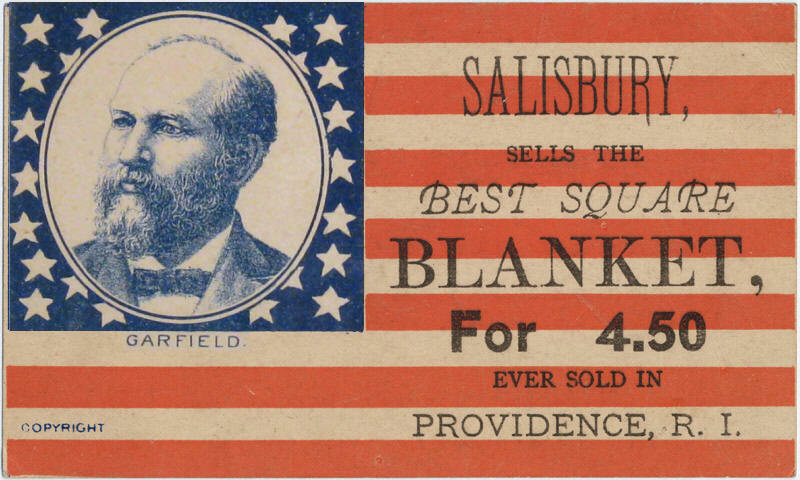 Salisbury's, selling the best square blanket ever sold in Providence! 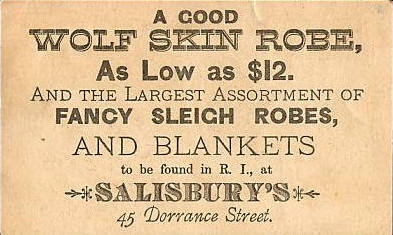 Salisbury's, was located at 45 Dorrance Street, Providence, Rhode Island. 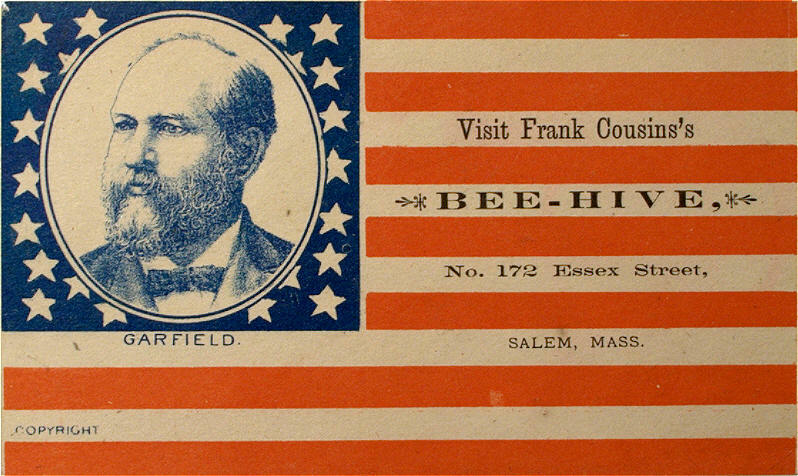 A companion Hancock card from Salisbury's, with the same overprint, is in the collection of the Smithsonian Museum of American History and is featured on the Star Spangled Banner Project website as a demonstration of the type. J.D. 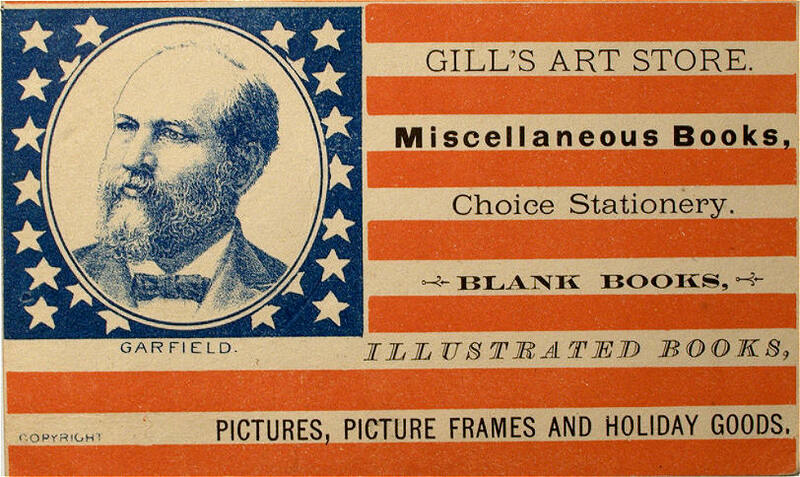 Gill's Art Store and Art Gallery was located in Springfield, Massachusetts. J.D. Gill grew his business from one of books and stationary to also include fine art. 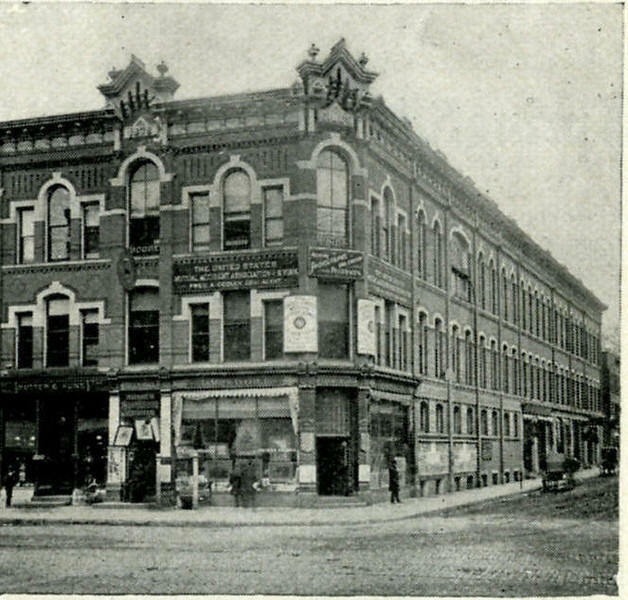 Although I've been unable to determine the exact address in Springfield of the store's location, a photo of Gill's Art Store is pictured here. 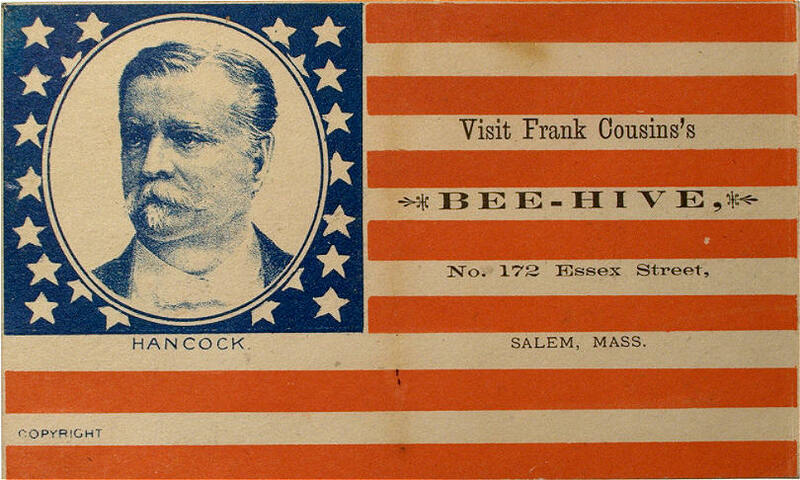 This rare pare of matched trade cards is from Frank Cousins's Bee-Hive, a general store located at 172 Essex Street, Salem, Massachusetts. While single trade cards are rare themselves, this is the only pair of matching trade cards of the style that I've ever encountered. 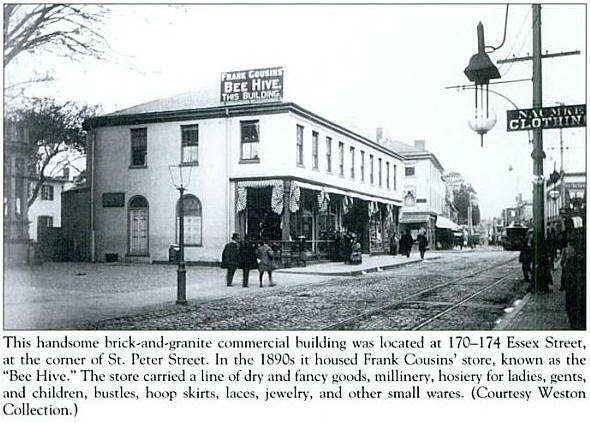 Pictured here is Frank's Bee-Hive located at the corner of Essex Street and St. Peter Street in Salem. Essex and St. Peters no longer intersect, the current location being near the current day Peabody Essex Museum. Will Lamson apparently chose to only print his advertisement on the reverse of his cards. His offerings are appropriately patriotic, selling celebratory campaign badges, candidate portraits, and fireworks. This very rare card has a patent date of September 4, 1883. 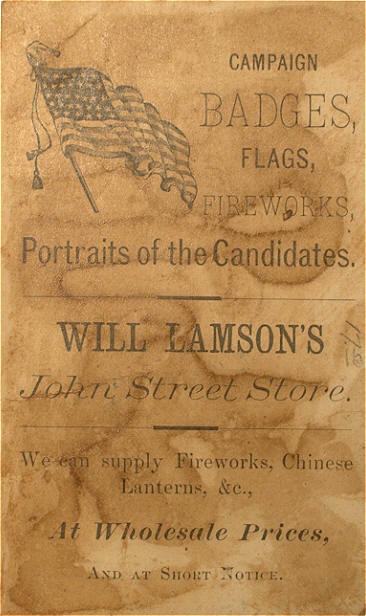 The card is a salesman's sample, with the reverse urging to place orders of these cards with your favorite candidate's portraits in the canton. This card, clearly a demonstration card, shows George Washington's portrait in the canton surrounded by a full complement of 38 stars.